A San Francisco cable car holds 60 people. This blog was viewed about 3,100 times in 2013. If it were a cable car, it would take about 52 trips to carry that many people. Amchart! I used random.org to come up with a random number from 1 to 4 and the winner was number 1. 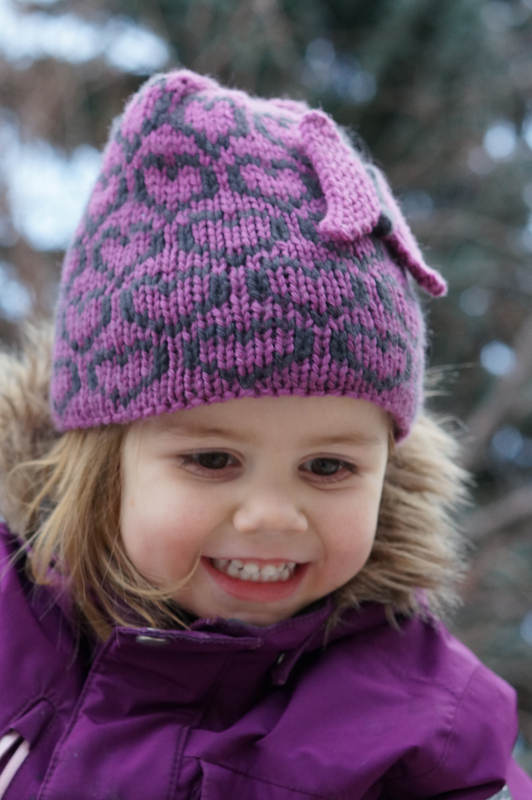 I will be contacting Amchart to let her know she’s the lucky recipient of the Cattywampus Hat pattern from Elizabeth Green Musselman. Thanks to all who participated and a special thanks to Elizabeth for doing the interview and providing a lovely prize. This is an extra-special Featured Indie Designer post for a couple of reasons. Firstly, it includes an interview with the lovely Elizabeth Green Musselman of Dark Matter Knits. Secondly, it features a fantastic giveaway, which you can read about at the end of the post. 1) Tell us a little about yourself. I’ve had a pretty itinerant life. I grew up in an Army family, so we moved about once every two years, which in some ways was tough, but I did get to live in Germany for six years in junior high and high school, and that was an amazing experience. At various times, I’ve wanted to be an architect, aeronautical engineer, and science journalist, but through some funny twists and turns ended up getting a Ph.D. in the history of science, and for 13 years I taught history at Southwestern University, a wonderful liberal arts college near my current home in Austin, Texas. I needed a change, though, and two years ago, I quit that job to pursue a career as a freelance knitting designer, editor, and teacher. 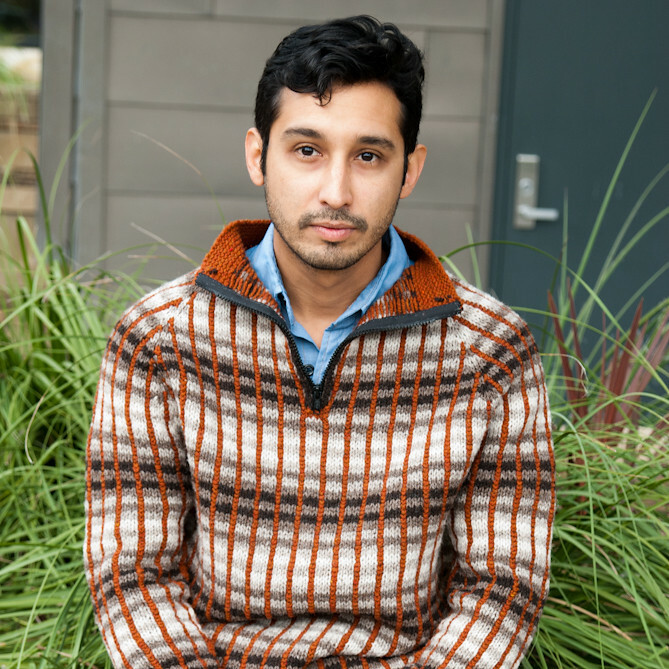 I’m now the book designer for Cooperative Press, design knitting patterns with a focus on men and boys under the moniker Dark Matter Knits, do graphic design work for people in the fiber industry, and teach knitting classes. My sweet husband is a philosophy professor at another liberal arts college in town, and our nine-year-old son is one of the funniest, quirkiest people I have ever known. I pretty much adore him with every woolly fiber of my being. 2) How did you start designing? That started about five years ago. I had been knitting for a long time (about 25 years at that point), so I’d been fascinated to watch how the internet exploded the world of knitting design. I’d always thought of pattern design as something that only a select few professionals did, but in the mid-1990s, I started seeing younger women and men who’d been knitting for just one or two years getting their designs out there, and I thought, “Why on earth am I not doing this? It looks like so much fun!” Since I have two guys in my life whom I love to knit for, I thought I’d find a niche by focusing on designs for men and school-aged boys. 3) Which is your favorite of your designs? That’s a tough one to answer, and I’d probably have a completely different answer tomorrow, but today I’ll choose my Modern Tartan sweater. I designed that for a pattern collection published by Hill Country Weavers, one of my LYSes and one of just a handful of stores that carries Jared Flood’s Shelter yarn. The challenge in my case was to create something for men with Shelter. I knew Flood would publish his own designs, and knew the muted, classic aesthetic he would choose, so I decided to go for something completely different: a colorful, vibrant, graphic look. I kept experimenting until I hit upon a combination of vertical and horizontal stripes that I liked. Then I structured the garment to look and fit like one of those zip-neck fleece pullovers. My favorite of the designs that I included in the GAL—that is, of my self-published designs—might be my Cattywampus Hat. 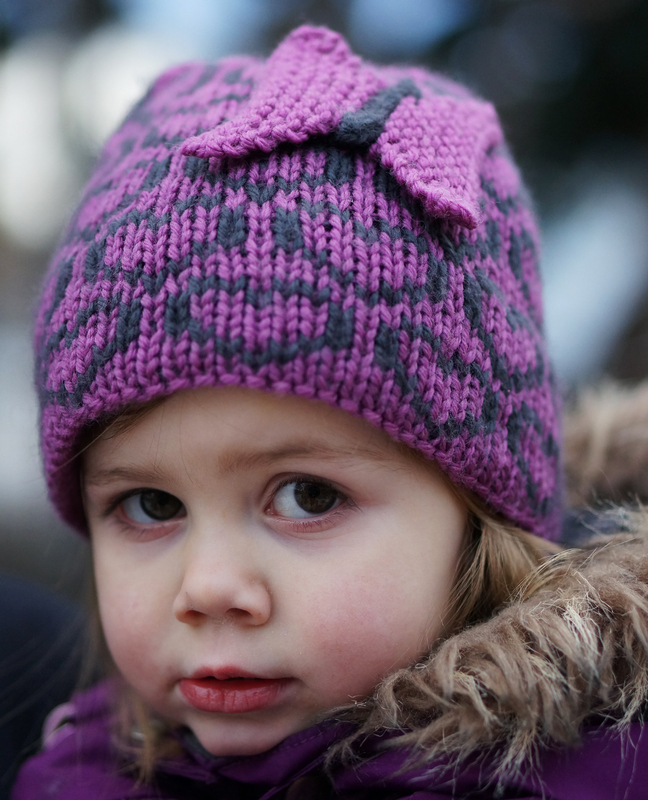 I love unusual constructions that are simple to knit, and this hat is a perfect example of that. The hat is worked up and down, and simple short rows and decrease/increase combinations are used to shape the crown and creates the biasing effect. 4) What has been your favorite part of the GAL so far? I’ve been delighted by how much community has formed around it; I didn’t expect that. Not only have the designers themselves really pitched in to make this work incredibly successfully—Lindsay Lewchuk (aka ecochicknits) deserves particular credit for that—but also people who have purchased the patterns are having a wonderful time participating in all the KAL/CALs and playing the various games that the organizers have come up with. It’s been a huge success. 5) Are you doing any gift knitting this year? A little—I tend not to plan on any, except gifts for my son’s teachers, but I get as many gifts knit or crocheted as I can. This year it’s looking like I’m not going to get very far! I’m sure none of you know the feeling…. I’d like to thank Elizabeth for such a great interview, it was a pleasure. And now for the giveaway! Elizabeth was gracious enough to offer a copy of her Cattywampus Hat pattern to one of my lucky readers. Just leave a comment below telling us which of her patterns is your favorite before Dec. 21st at 11:59 pm EST. I’ll do a random number draw and will announce the lucky winner the next day. Good luck! Despite my best efforts, my little girl is as girly as they come. When asked what she wanted on her hat the answer was definitively “Hearts, with a butterfly on top.” Well, my girl, ask and ye shall receive. I present you with the girliest hat ever. 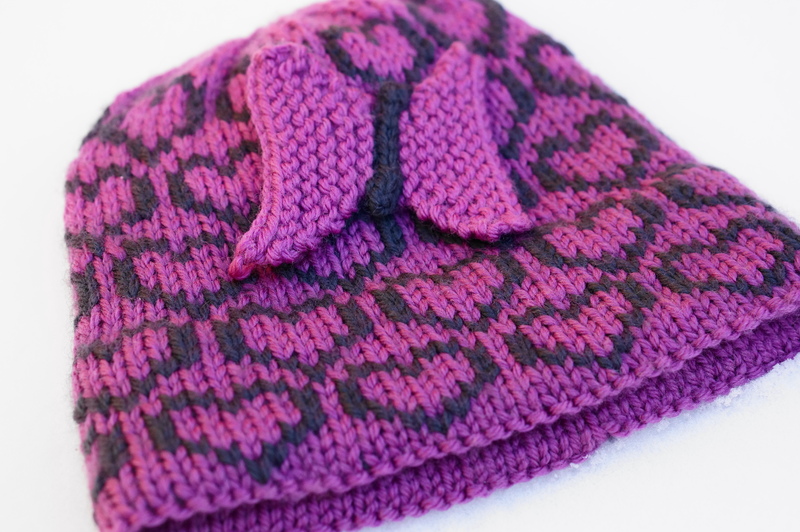 This hat features an all-over heart design knit using stranded colorwork. The bottom of the hat is hemmed, providing a nice thick band to keep ears nice and toasty on cold days. There are also instructions for the optional butterfly to be sewn on after. Sizes: Preemie (Newborn, Baby, Toddler, Child or Teen, Adult), fits 12 (14, 16, 18, 20, 22)” [30 (35, 40, 45, 50, 55) cm] circumference. Another big thanks goes out to Eleanor Dixon for technical editing, and to the adorable Eloise (aka Doodie) for modeling! 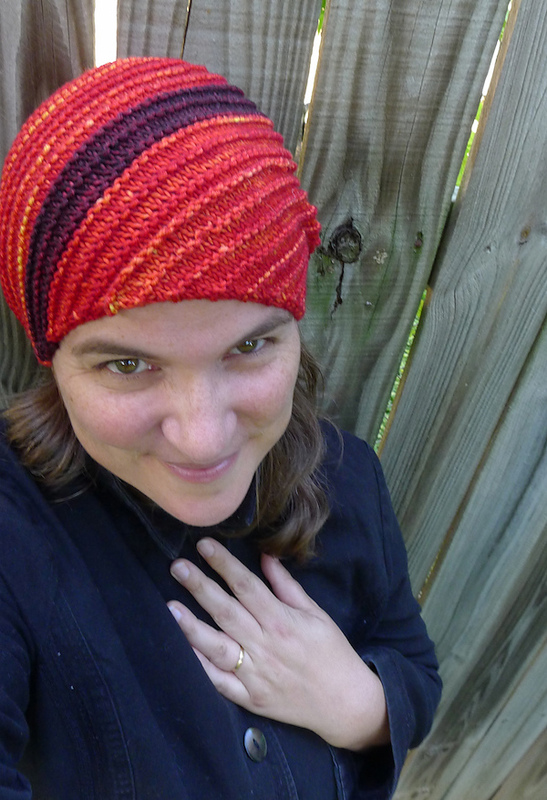 From now until the end of Saturday, Dec. 7th, the pattern is available for 50% off! And don’t forget, this is also eligible for all the Gift-A-Long fun!